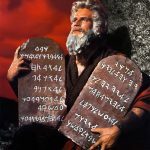 If you’ve ever seen Charlton Heston in The Ten Commandments you’ll probably have an image of Moses holding two stone tablets with the commandments etched into them (see left). But what did God actually write on those slabs of rock? In order to understand the context of the law, we need to look back to Exodus 194-6. Here, God speaks directly to Moses and tells him what to convey to the children of Israel. God begins by reminding his people that the context of the law was the salvation he had provided. He then speaks of the loyalty he demands (“…you will indeed obey My voice and keep My covenant”) before declaring the blessings he offers (“you shall be a special treasure to Me above all people”). There is a clear progression – what God has achieved for us, what he requires from us and what he will do for us. As in chapter 19, he begins by reminding his people that he is the Lord of salvation; everything else that follows is in that context. Since he has redeemed us with the precious blood of the Lamb (1 Peter 1:18-19), loyalty and servitude is as required of us today as it was of Israel then. The secret to successful Christian living is to remember always where we’ve come from. That’s why God took great pains to remind his people of their liberation from Egypt. Paul reminds the Ephesians in like fashion: “You He made alive, who were dead in trespasses and sins, in which you once walked according to the course of this world…” Notice the assumption that we once walked according to the world; now that we are saved, we no longer walk in this way. In one of my favourite sitcoms, psychiatrist Frasier Crane finds himself tutoring a reluctant teenager in history. The student, Kirby, is less than committed and Frasier asks him why. “’Cause it’s a bunch of junk I’m never gonna need to know,” cries the boy. It’s good advice for the Christian, but with one important distinction. Understanding where we’ve come from is not about deciding where we want to go; it’s about knowing what God requires from us and how his authority over us is final. Do we really demonstrate the level of obedience our Lord of glory requires?